Carnival Triumph is moving into an interesting new assignment for the line next year. The ship's basic assignment is to be homeported at Ft. Lauderdale for four- and five-night cruises during the winter season. During the summer and fall months, the ship moves north to New York for a variety of interesting longer itineraries. As it repositions north and south en route to and from New York it sails short series of five- and six-night cruises from Norfolk. A woman aboard Carnival Elation fell from her balcony to a deck several decks below, resulting in her death this morning. Norwegian Cruise Line will be shuffling their largest ships among home ports as revealed when the line released their winter 2019/2020 programs this week. Next winter (2018/2019) MSC will have a second ship homeporting at Dubai. MSC Lirica will be sailing longer cruises from the UAE port to the Gulf and India. Seattle chef Ethan Stowell has joined Holland America's Culinary Council. Carnival has declared a 45-cent-per-share quarterly dividend. You may remember Carnival's Fathom brand. They came into being to operate people-to-people programs in the Caribbean, and began with several options in the Dominican Republic, operating with P&O's former Adonia. Then they branched out with programs in Cuba. Then P&O wanted their ship back and Fathom became a Carnival brand without a ship. They have developed several people-to-people shore excursions that are available as day excursions on other Carnival brands calling at the DR. Now they've developed a program which has been sold as a group on a Crown Princess sailing in January. It was such a success, Fathom and Princess have scheduled two more group sailings in March and May of this year. The Greek island of Santorini is one of the most popular in the world, both for cruise visitors and those on land-based holidays. The problem is that it has become too popular for its own good and visitors are far exceeding capacity. When that happens, it's not good for visitors, residents or the island's resources. The island has come up with an interesting solution. The CDC has released an inspection report that reveals a third Carnival Cruise Line ship has failed it's most recent surprise inspection by USPH inspectors. 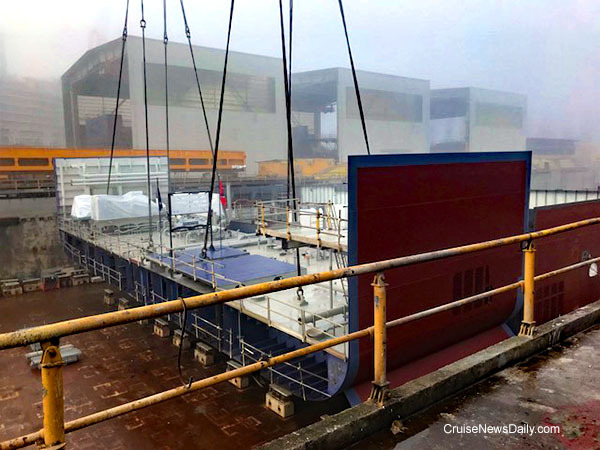 The surprising part is that it was Carnival's newest ship, Carnival Vista, and the newer the ship, usually the easier it is to keep clean and attain a high score because they are built to make it easier to keep clean. MV Werften has cut the first steel for Crystal Cruises' first polar-class expedition yacht, Crystal Endeavor. The event took place yesterday at their Stralsund (Germany) yard. Have you missed Carnival Victory? It's been at Grand Bahama Shipyard for the last couple of weeks, since January 4 engaged in a multi-million-dollar refit that will see a number of new facilities added by the time it returns to service on January 21. Many of the new additions we have seen on other Carnival ships, and Carnival Victory is just being brought up to date with Carnival's newest dining and drinking venues, but there are also some that aren't that familiar.